Come and celebrate 50 years of Barbados Independence with us in our second fundraiser for Haiti, this time at Sugar Dumplin restaurant in Glasgow. Enjoy a welcome cocktail courtesy of Clayton’s Kola Tonic and Caribbean buffet from Sugar Dumplin. Talk from historian and genealogist Selena Carty from Black Poppy Rose for stories of the contribution of Caribbean servicemen and women to Britain in times of war. Enter our raffle to win great prizes and buy something from the special menu for a chance to win a week’s stay for two at Divi Southwinds Beach Resort, Barbados. All profits from tickets and raffle going to support community organisations in Haiti. This is a very nice cocktail and I will be ordering this again. Once I got my welcome drink I looked for a table, I wanted something near where the performances were so I could try and get some good photos and videos and to get a good view. The DJ for the night was already setting up and started playing some tunes, while we waited for everyone else to turn up. I really liked the tunes he played and was happy that it wasn’t loud that you needed to shout over it. Everyone was ready and it was time for the event to offically start. A Lisa Williams from The Edinburgh Caribbean Association got up and welcomed us to the event, and what we were to expect from the evening. Lisa’s welcome speaks started with its now 50 years that Barbados has been independent, and how this event and others are continuing to support Haiti and a brief talk about Haiti. Lisa then introduced us to the first guest speaker Selena Carty. Before tonight I didn’t know any of the names that were going to be speaking or performing. Selena Carty is a Historian and founder from Black Poppy Rose on British West Indies Regiment in WW1. TO REMEMBER THE LEGACIES THAT BEFALL EACH AND EVERYONE OF US. THE BLACKPOPPYROSE IS A SYMBOL TO NOT ONLY HIGHLIGHT BUT HONOUR AND REMEMBER THE CONTRIBUTIONS MADE TO VARIOUS WARS SINCE THE 16TH CENTURY BY THE AFRICAN/BLACK/CARIBBEAN/PACIFIC ISLANDERS COMMUNITIES. What Selena was telling us was very emotional, powerful and very educational. If you ever get a chance to see her and to listen to her do take the time. Next was some touching and funny poetry from Lesley Traynor, from Woman Poets with Fierce words. Lesley told us a little about herself and let us hear a few poems, one was even about a family member and one which was my favourite from the night was called “Big Bad WolF”. I am not really into poetry but I did enjoy listening to Lesley, and by going to this event I got to try something I wouldn’t normally have gone to see. Now its was time to get some food from the buffet, I just took a small sample of everything. I have to say I have been to Sugar Dumplin before but whatever glaze they used tonight on the chicken wings wow it was amazing!!! The next act to go up was Chief Kofi Amu Master Drummer who was from Ghana, and he was also going to do poetry for us. This type of poetry again was new to me, and different to Lesley’s. Chief Kofi was very entertaining, and even got some audience participation with everyone going “mmmmm” a lot….you had to be there. The next act was my favourite part of the event, it was very entertaining and great to listen to. The act that ended the night were called Ladies of Midnight Blue. Ladies of Midnight Blue are an Afro-Jazz Fusion brass/drums and vocals act. Ladies of Midnight Blue’s performance was entertaining, amazing to watch and listen to but also since they are so energetic on the drums you feel tired just watching them. For me I would love to see them perform again, so I will be keeping an eye out for when they are back in Glasgow. Near the close of the night there was a charity raffle, where you could win goodie bags with random items e.g Jam, sugar etc all from Barbados. I was lucky to win a bag, which contained several booklets on Barbados and also some “Hot Hot” sauce which I will use at some point. Overall I had a really good night, it was educational and entertaining. I learned about black history, different styles of poetry and got to experience Afro-Jazz for the first time. Everyone around me also really enjoyed the night, as there were lots of smiles, laughs and dancing. For the past few years I have always made a point, of going to Edinburgh to see the Christmas Market. In my opinion the Edinburgh Christmas market is always 100% better, why? There are more stalls, better layout, the stalls are a lot more varied, and it looks and feels like a proper European Christmas Market. The layout this year was a lot better, everything just flowed and helped make it look just that little better. This year Edinburgh have the ice rink, as I have heard Glasgow and Edinburgh take turns. The ice rink can be found at St Andrews Square, the last time it was here there were a few stalls but this time round its just the ice rink. Some items for sale are expensive, but if you do look about you will find some that are ok priced. I recommend the hot mulled wine while you walk about, keeps you warm and is very nice. If you have only ever seen the Glasgow Christmas market, please do check out the Edinburgh one it’s a lot better and has a more festive feel and atmosphere. I had a day off work so I decided to take a trip to Edinburgh to see the shops, and the Christmas Market and see what sales were on. 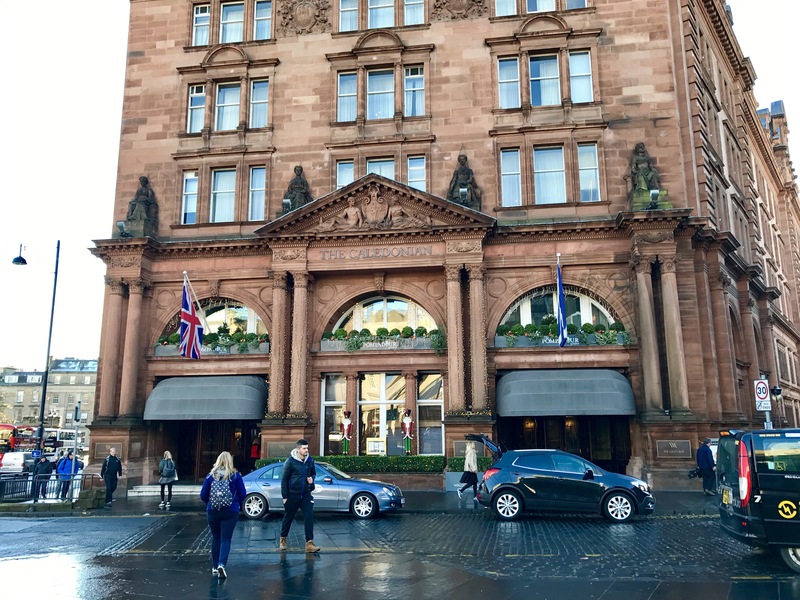 I visited the Waldorf Astoria Hotel on my last visit to Edinburgh, and really enjoyed it so I thought I would do the same again this time and it would make a nice start to the day trip. On entering this time I noticed that they had decorated for Christmas, and they had decorations all over. This was very nice to see, and put me in a very festive mood. The room that the Afternoon Tea and snacks are in is called the Peacock Alley Lobby Lounge, this is where I was last time and felt very relaxed. As you can see by the photos it’s a very nice looking area, I didn’t take lots of photos as there were other people about so if you want to see more check the website. I had put some money aside the past few months to treat myself to this, as yes it’s a little costly but I wanted to see what it was like. On arrival you are presented with the three tier stand, and told that once you have eaten the bottom two places the rest will follow. Presentation wise this is very nice, and similar to others I have had in the past….so now it was time to start eating. Everything I tasted on the bottom two tiers was very nice, very fresh and very tasty. Once they were finished we waited a little, and then the other two plates arrived. The scones were very warm so I am guessing freshly made, and the cakes looked very nice. Nothing beats proper cream on a scone and jam, this for me is always a winner as a lot of places use cheap cream or whipped spray cream which never works or tastes as nice. Overall for me this was a really good Afternoon Tea, the cost of this is similar to some hotels in Glasgow but you never get this amount probably only half this. Everything about this was perfect and next visit I would have again. This is now in my top three afternoon tea places, followed by the Glasgow Corinthian and then La Bonne Auberge. This is a solid 10 out of 10 for me, excellent value for money due to the amount you get. If you put some money aside and like Afternoon Tea’s do check here out, the atmosphere etc you will love.